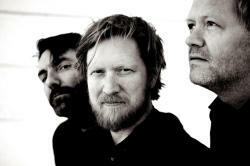 Norwegian musicians will perform at Baku Jazz Fest-2018. Baku residents will gather in Rotunda Jazz Club to hear Norwegian trio, which includes Helge Lien (piano), Mets Eilertsen (bass) and Per Oddvar Johansson (drums) on October 25, Novosti.az reported. Helge Lien and his musicians developed their own approach to chamber jazz, which stands out in its harmoniously complex tones. He is an internationally acclaimed musician who explores the borders between different musical genres, but whose sound as a jazz pianist is always a distinctive feature. The core of Lien’s work has since 1999 been the Helge Lien Trio, consisting of the classic jazz constellation piano, bass and drums. In 2008 the trio won the Norwegian Grammy for their album Hello Troll, and has achieved international acclaim following nine international album releases, as well as numerous tours and festival performances in Japan, Canada, South Korea, Europe and Scandinavia. Lien is also known from a variety of other musical contexts, such as Tri O’Trang, the duo Hero with saxophonist Rolf-Erik Nystrom, and with the vocalists Silje Nergaard, Frida Ånnevik and Jørn Simen Øverli. In 2014 Lien was given the honour of composing the official concert celebrating the anniversary of the birth of Norwegian beloved poet and playwright Alf Prøysen. In addition to his activities as composer and performer, Lien is currently employed as an associate professor in jazz at the Norwegian Academy of Music in Oslo. Originally influenced by Bill Evans’ lyric-dynamic style of playing, he also shows affinity with Keith Jarrett’s narrative inventiveness and the subtle strophic expression of Brad Mehldau. Although contemporary and constantly moving forward, Lien’s heritage from growing up in an environment of untouched nature and folk music is noticeably ingrained in his sound. Today Lien is an equally innovative and technically brilliant player. Lien proves himself as an excellent "composer of the moment" in all of his work – regardless of genre. Notably, Baku Jazz Fest-2018 will take place in Baku on October 14-28, bright together local and foreign jazzmen. Various exhibitions, competition of young jazz musicians and other events are organized as part of the festival.